Split Creek Point is located in the Salmon River Mountains, near the confluence of the Secesh River and South Fork Salmon River. It’s the highpoint of the ridge that separates Split Creek from the Secesh River. There’s a good trail leading up Split Creek to the summit, which is home to an old log cabin built by the CCC in 1933. The summit was also once home to a 72’ tall fire lookout tower that has since been removed for safety reasons. During summer, the shortest access is via McCall and Lick Creek. But in spring, we got to enjoy the longer but highly scenic drive along the South Fork Salmon River. Tom and I came up from Boise, with Splattski and Art coming down from McCall. We road together from Cascade to the trailhead, enjoying the scenery and lively conversation. A bunch of downed trees over the road meant an extra mile of hiking before we got to the official trailhead, where we left the road and began hiking the nice shady trail. Soon enough we were on patchy snow, and numerous downed trees from winter storms created a nice steeplechase course for us, including several creek crossings. Some crossings were more eventful than others. As we neared the head of the Split Creek drainage, we were faced with the first steep climbing of the day, and some fresh snow (now slushy) on top added to the challenge. But soon enough, we gained the ridge and gentler terrain. The weather was stellar as we hung a right and made our way southeast toward the summit. Then after one sort of steep section, we arrived at the highpoint. Once on the summit, we explored the old cabin, which was in surprisingly good shape. We also enjoyed some well-deserved Fritos that Art had brought along. I think he had them for emergency fire starter, but they also make a tasty snack. After some deliberation, we decided to follow the ridge back to the car to create a loop and some great views. (Loops tend to happen when you hike with Splattski.). Shortly after leaving the highpoint, we came across some very fresh bear tracks in the snow. And a lot of them too, with tracks going back and forth across the ridge in several places. We never did see the bear, but seeing the fresh tracks certainly added to the excitement of the day. As we continued down the south facing ridge, the snow coverage got thinner. This wasn’t good since we now had to deal with downed trees, thick brush, and sometimes both combined. The bushwhacking wasn’t too bad other than a couple spicy sections. Soon enough it let up and allowed us to pick up the pace again. The views coming down the ridge were great in all directions. John’s infamous “Hum Ridge” was very impressive to our right, with the Secesh far below us on the left. Rugged country was all around us. Soon enough we got down to ~4900’ elevation, which looked like a good spot to hang a right, and slide down the steep hillside to the road. Fortunately we were able to make use of a good elk trail which made the descent much easier that it could have been. We hit the road with the car in sight. Not bad for bushwhacking. Hooray for GPS! It had been an excellent day in the mountains. Round trip was just over 9 miles and 2500’ elevation gain, in 7.5 hours. Great hike, great scenery, and great company. Hard to beat. 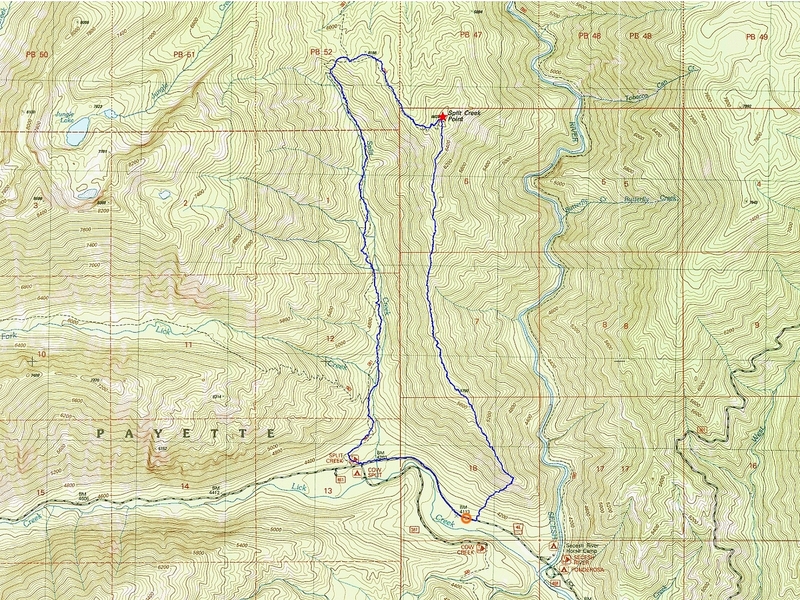 Map of the route, just over 9 miles and 2500' elevation gain round trip. We went clockwise. A few trees blocking the road made our hike a little longer. Soon enough we were on snow. Summit of Split Creek Point. The back of the cabin. Group splattski shot on the summit. Another view of the cabin. Looking down into the Secesh River valley. A little brushy in places. Nice views from our descent route. Steep downhill where we left the ridge.